Salivary gland (glandulas salivales). There are small and large salivary glands; the nature of allocated secret mucous membranes, protein and mixed. Minor salivary gland cancer, mucous and mixed, are located in the submucosal layer lips, cheeks, palate, tongue. Large salivary glands (paired) - parotid, submandibular, sublingual (Fig. ); their secretory function is of great importance for digestion (see Saliva, Saliva). Parotid relate to protein and submandibular and sublingual - to mixed. Parotid gland (gl. раrotis). The bulk of it is pozavcherashny hole anterior cancer lies on the chewing muscles. With the lateral surface of iron covered with dense parotid fascia, which in gland leave the jumper, dividing it into slices. In the thickness of the parotid passes facial nerve with its main branches, the external carotid artery, a large vein. Excretory duct of the salivary gland has off and vnutricletocny departments. The mouth of the outlet duct is located on the mucous membrane cheeks at the level of the first and second molars of the upper jaw. The blood supply - branches superficial temporal artery. Submandibular salivary gland (gl. submandibularis) is located in the submandibular triangle. Excretory duct of its offer in the anterior sublingual region on the hyoid the flesh. The blood supply - branches of the facial artery. Sublingual salivary gland (gl. 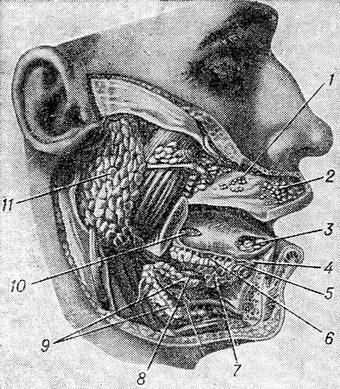 sublingualis) is located in the hyoid space on oral sublingual muscle, next to outlet duct submandibular salivary glands. The main excretory duct opens on the hyoid the flesh. Small ductless - sublingual fold. The blood supply - branches lingual artery.